Join us on a gastronomic adventure spanning two sides of the Grand Canal. You’ll visit four of the best eateries in Venice, learning how to find great food in the Floating City. The best way to understand the history of Venice is through its food. With your guide you’ll visit the famous Rialto Fish Market & more, learning about the culture of the city. All-inclusive pricing means we’ve covered the price of your cicchetti, wine, fritti, pasta and even the gondola we use to cross the Grand Canal. So you can leave your wallet at home. 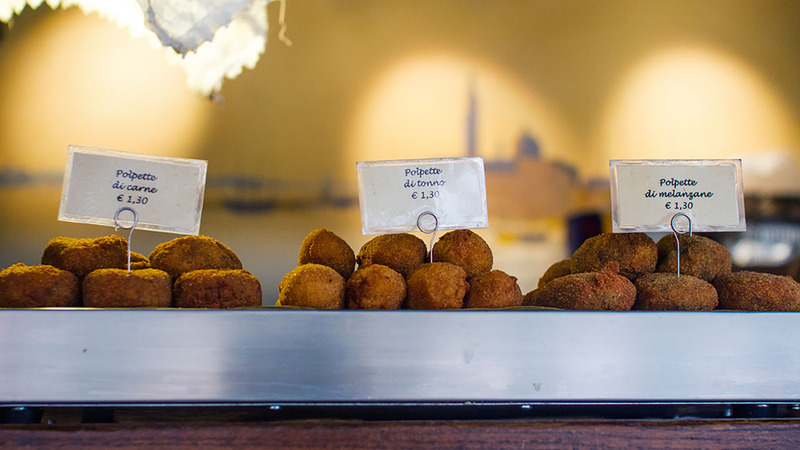 Venice has a food culture quite unlike anywhere else in Italy – or the world, for that matter. There is no farmable land here; so no meat, dairy or grains. Originally constructed of wood, the whole city was a fire hazard; so no wood-burning ovens for pizza. As a trading city though, Venice did have access to spices from around the world, not to mention endless access to fish. On this small group Venice Food Tour, you’ll get to the heart of the city through its stomach, dispelling those vicious rumors that there’s no good food in Venice. Of course there is, you just need to know where to look! Your first food stop is one of our favorites. This bacaro is a popular gathering spot for locals thanks to its unbeatable cicchetti and a mean spritz. 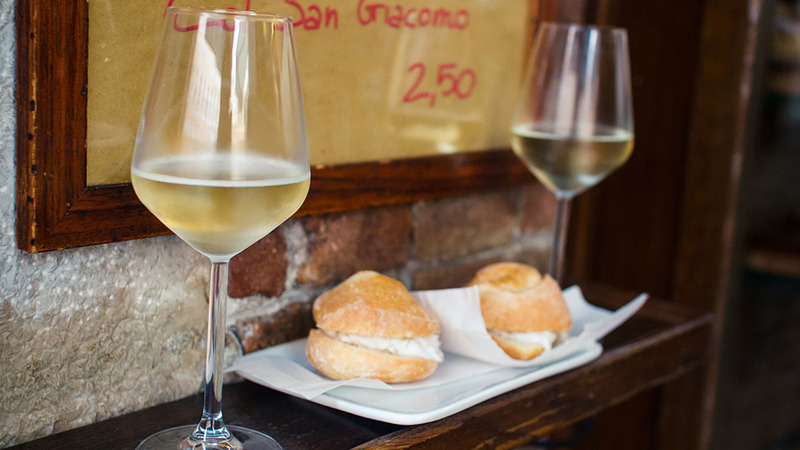 You’ll try two items of your choice here along the local wine, prosecco, and spritz. We would highly recommend the baccalà, a salted cod dish served here whipped, slathered on bread and so fresh it will knock your socks off. Next up is another great cicchetti bar. 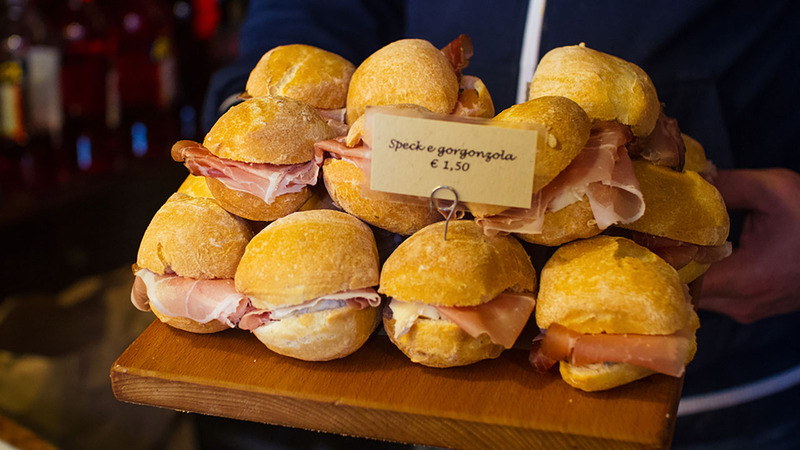 Like the Spanish tapas, cicchetti is a food form synonymous with Venice. 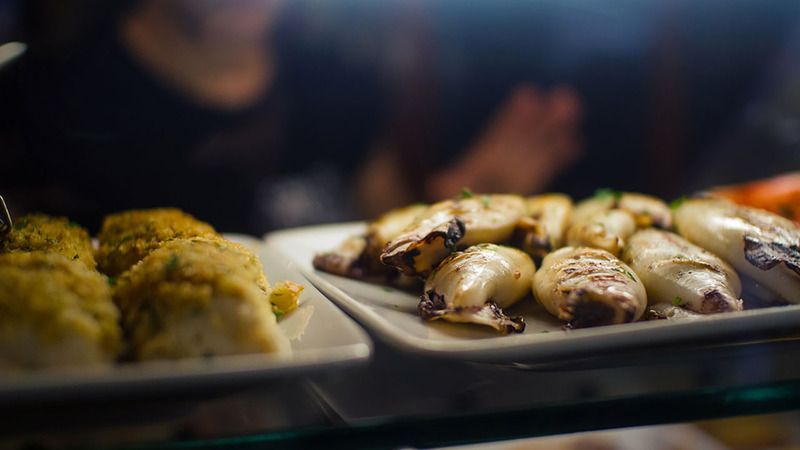 Although menus change daily, they are usually dominated by crostini; slices of bread with various creative toppings; panini, which we know as sandwiches; and fritti, or fried food – mostly fish and vegetables. 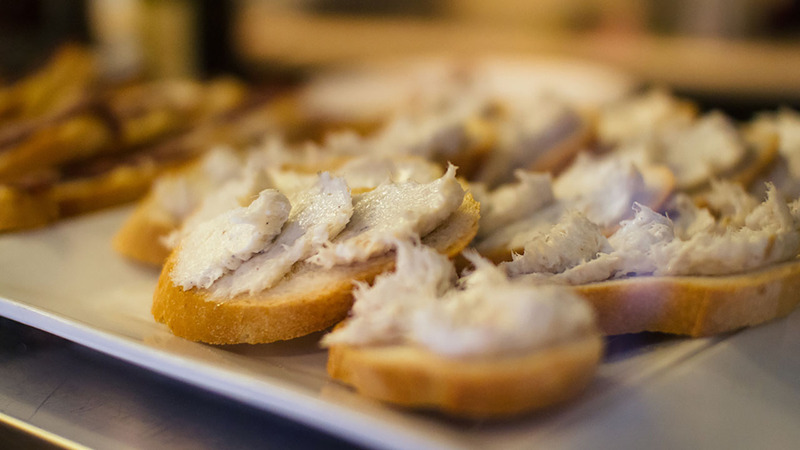 Cicchetti are a big part of Venetian food culture, as the perfect snack for fisherman, who arrive home from sea around 9am and settle down in their favorite dark bars for a bite to eat and a glass of wine. You won’t just eat as the locals do, you’ll travel like them too! Hop aboard a gondola to cross the Grand Canal with your guide, disembarking by Ca d’Oro (or the ‘Gold Palace’) in the historic neighborhood of Cannaregio. While tourists clog the streets between Rialto & St. Mark’s Basilica, Cannaregio is where locals congregate. Historically the Jewish Ghetto, it’s the most historic and storied part of the city, as you’ll learn from your guide. Settle down in this lovely neighborhood for yet another glass of wine and a plate of the city’s best fresh fish pasta. Before you part ways with your local expert, they’ll give you recommendations for restaurants and bars to suit your palate, so that you can continue eating and enjoying Venice like a local. They’ll give you tips on how to avoid the more touristy restaurants and where to seek out the best food at the best prices – and what to try when you get there. Traveling in small groups of only 15 people throughout your tour, you’ll find it easy to engage with your local guide, and to ask all the questions you can think of. With their help you’ll learn about Venice through its incredible food, and manage to avoid those pricey, mediocre meals your friends warned you about. My wife and I really enjoyed the Venice food tour. Roberta was an amazing guide and we enjoyed the food very much, would highly recommended this tour! This tour is very well organized from beginning to end. I knew I was going to have a great day the instant we met Francesca. Sheâ€™s very friendly and upbeat, and her English is excellent. Francesca shared so many interesting facts about Veniceâ€™s history and food with us. The food and the wine were wonderful and the company even better. Francesca is a great guide and a lovely person. Visiting 2 bacari followed by a sit-down pasta lunch at a restaurant was an excellent way to try a variety of Venetian foods, wine, prosecco and spritz. The portions (food and wine) were all very generous. Fantastic tour! Thank you so much. Roberta was a wonderful guide, very friendly and informative, a real asset to Walks of Italy - highly recommended. Because so much of the food on this tour is chosen by you, it is perfectly suitable for most preferences (such as vegetarians). Please be aware though that there is a lot of bread, batter and fish used in Venetian food so coeliacs in particular may not find much to eat. As in all Venetian cuisine, there is also a considerable emphasis on fish.